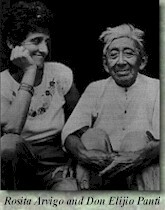 enturies old Mayan herbal remedies handed down to Don Elijio Panti, the 103 year old Mayan H'men (shaman) and his apprentice Rosita Arvigo, wild crafted in the shadows of the great Mayan pyramids of Belize, Central America. These plants are gathered with prayer and care according to ancient Mayan ritual by the traditional healers indigenous to this land. The ingredients in Rainforest Remedies are wild-crafted from rainforest areas that have been cited for development, and contain Bio-active compounds which assist normal metabolic functions. Traditional healers have used these remedies for 1000s of years to promote the health of the human body and soul. A portion of the procedes of these products are used to support the traditional healers, apprentices, educational programs and conservation agencies to help prove that the rainforest is worth more standing than destroyed.